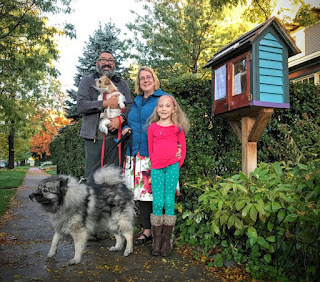 Our Little Free Library has been totally pillaged lately - as in, someone comes every day and totally cleans it out to take it to Half Price Books or something. I think we're going to close it down for awhile, which bums me out. And I do mean "totally pillaged." I love it when the books fly off our shelves —it means that people are reading — but this was about the 12th time in the past couple of months that someone had completely cleared it from stem to stern. I'm a voracious reader, when everything from an ABC board book to old-school westerns to Faulker's As I Lay Dying all go in one fell swoop, I know that something is up. His story went viral, and today I was called by WCCO, and tonight we were on KARE 11 about it. The story has actually raised a lot more controversy than I thought (pro tip: never read the comments), from people who think LFLs are dumb, or ugly, or don't understand how they work, or don't see why anyone uses them, or think that we already somehow have "enough" books in society so they are redundant, or don't understand why we are upset about people taking books that are free. I liken the last statement to cookies, honestly; I like to bake cookies, and I like to share them. I love to have people over for cookies. But if you come over and always eat all of my cookies, and don't share with anyone else (or basically take my cookies and go out and sell them), I'm eventually not going to want to give you cookies anymore. I love my Little Free Library, and I love to share books. I think they do a great job of building community, and I hope to open ours again soon. I disagree with the people who say that naturally people will abuse them simply because they are free — because I just don't want to believe that about humanity. I want the kids walking down to Webster/Obama school to be able to grab books as they go to school, and I want to put out books I have just read and enjoy ones that people drop off there. I just don't want one person to ruin it for all of us. ETA: One thing I should have made clear in this post yesterday — I do NOT see this as an issue caused by used booksellers! I love used bookstores (especially Sixth Chamber on Grand at Hamline, go support them right now while there is construction outside their shop! ), and one of my closest friends is an online used book dealer and I love the fact that she is constantly on the lookout for good books and trying to find them great homes where they will be read. The sellers I have met have always had the highest integrity, and one has even offered to send us a box of books to restock!